Spatial memory is required to navigate through an environment. In cognitive psychology and neuroscience, spatial memory is that part of the memory responsible for the recording of information about one's environment and spatial orientation. For example, a person's spatial memory is required in order to navigate around a familiar city, just as a rat's spatial memory is needed to learn the location of food at the end of a maze. It is often argued that in both humans and animals, spatial memories are summarized as a cognitive map. Spatial memory has representations within working, short-term memory and long-term memory. Research indicates that there are specific areas of the brain associated with spatial memory. Many methods are used for measuring spatial memory in children, adults, and animals. Short-term memory (STM) can be described as a system allowing one to temporarily store and manage information that is necessary to complete complex cognitive tasks. Tasks which employ short-term memory include learning, reasoning, and comprehension. Spatial memory is a cognitive process that enables a person to remember different locations as well as spatial relations between objects. This allows one to remember where an object is in relation to another object; for instance, allowing someone to navigate through a familiar city. Spatial memories are said to form after a person has already gathered and processed sensory information about her or his environment. Working memory (WM) can be described as a limited capacity system that allows one to temporarily store and process information. This temporary store enables one to complete or work on complex tasks while being able to keep information in mind. For instance, the ability to work on a complicated mathematical problem utilizes one's working memory. One highly influential theory of WM is the Baddeley and Hitch multi-component model of working memory. The most recent version of this model suggests that there are four subcomponents to WM, namely the phonological loop; the visuo-spatial sketchpad; the central executive; and the episodic buffer. One component of this model, the visuo-spatial sketchpad, is said to be responsible for the temporary storage, maintenance, and manipulation of both visual and spatial information. Baddeley and Hitch's multi-component model of working memory. In contrast to the multi-component model, some researchers believe that STM should be viewed as a unitary construct. In this respect, visual, spatial, and verbal information are thought to be organized by levels of representation rather than the type of store to which they belong. Within the literature, it is suggested that further research into the fractionation of STM and WM be explored. However, much of the research into the visuo-spatial memory construct have been conducted in accordance to the paradigm advanced by Baddeley and Hitch. Research into the exact function of the visuo-spatial sketchpad has indicated that both spatial short-term memory and working memory are dependent on executive resources and are not entirely distinct. For instance, performance on a working memory but not on a short-term memory task was affected by articulatory suppression suggesting that impairment on the spatial task was caused by the concurrent performance on a task that had extensive use of executive resources. Results have also found that performances were impaired on STM and WM tasks with executive suppression. This illustrates how, within the visuo-spatial domain, both STM and WM require similar utility of the central executive. Additionally, during a spatial visualisation task (which is related to executive functioning and not STM or WM) concurrent executive suppression impaired performance indicating that the effects were due to common demands on the central executive and not short-term storage. The researchers concluded with the explanation that the central executive employs cognitive strategies enabling participants to both encode and maintain mental representations during short-term memory tasks. Although studies suggest that the central executive is intimately involved in a number of spatial tasks, the exact way in which they are connected remains to be seen. Spatial memory recall is built upon a hierarchical structure. That is to say that people remember the general layout of a particular space and then "cue target locations" located within that spatial set. This paradigm includes an ordinal scale of features that an individual must attend to in order to inform his or her cognitive map. Recollection of spatial details is a top-down procedure that requires an individual to recall the superordinate features of a cognitive map, followed by the ordinate and subordinate features. Thus, two spatial features are prominent in navigating a path: general layout and landmark orienting (Kahana et al., 2006). People are not only capable of learning about the spatial layout of their surroundings, but they can also piece together novel routes and new spatial relations through inference. Yet, this field has traditionally been hampered by confounding variables, such as cost and the potential for previous exposure to an experimental environment. Thankfully, technological leaps have opened a new, albeit virtual, world to psychologists. A cognitive map is "a mental model of objects' spatial configuration that permits navigation along optimal path between arbitrary pairs of points." This mental map is built upon two fundamental bedrocks: layout, also known as route knowledge, and landmark orientation. Layout is potentially the first method of navigation that people learn to utilize; its workings reflect our most basic understandings of the world. Hermer and Spelke (1994) determined that when toddlers begin to walk, around eighteen months, they navigate by their sense of the world's layout. Indeed, it would seem that a sojourning toddler's world is a place of axial lines and contrasting boundaries. McNamara, Hardy and Hirtle identified region membership as a major building block of anyone's cognitive map (1989). Specifically, region membership is defined by any kind of boundary, whether physical, perceptual or subjective (McNamara et al., 1989). Boundaries are among the most basic and endemic qualities in the world around us. These boundaries are nothing more than axial lines which are a feature that people are biased towards when relating to space; for example one axial line determinant is gravity (McNamara & Shelton, 2001; Kim & Penn, 2004). Axial lines aid everyone in apportioning our perceptions into regions. This parceled world idea is further supported items by the finding that items that get recalled together are more likely than not to also be clustered within the same region of one's larger cognitive map. Clustering shows that people tend to chunk information together according to smaller layouts within a larger cognitive map. Boundaries, though, are not the only determinants of layout. Clustering also demonstrates another important property of our relation to spatial conceptions. This is that spatial recall is a hierarchical process. When someone recalls an environment or navigates terrain, that person implicitly recalls the overall layout at first. Then, due to the concept's "rich correlational structure", a series of associations become activated. Eventually the resulting cascade of activations will awaken the particular details that correspond with the region being recalled. This is how people encode many entities from varying ontological levels, such as the location of a stapler; in a desk; which is in the office .. Alas, layout has its flaws too. One can recall from only one at region at a time (a bottleneck). A bottleneck in a person's cognitive navigational system could be disastrous, for instance if there were need for a sudden detour on a long road trip. And yet, people are still capable of getting place to place functionally. Lack of experience in a locale, or simply sheer size, can disorient one's mental layout, especially in a large and unfamiliar place with lots of overwhelming stimuli. In these environments people are still able to orient themselves, and even find their way around using landmarks. This ability to "prioritize objects and regions in complex scenes for selection (and) recognition" was labeled by Chun and Jiang in 1998. Landmarks give people guidance by activating "learned associations between the global context and target locations." Mallot and Gillner (2000) showed that subjects learned an association between a specific landmark and the direction of a turn, thereby furthering the relationship between associations and landmarks. Shelton and McNamara (2001) succinctly summed up why landmarks, as markers, are so helpful: "location...cannot be described without making reference to the orientation of the observer." It is fairly clear that people use both the layout of a particular space, as well as the presence of orienting landmarks in order to navigate. Yet, psychologists have yet to explain whether layout affects landmarks or if landmarks determine the boundaries of a layout. Thus, this concept suffers from a chicken and the egg paradox. In fact, McNamara has found that subjects use "clusters of landmarks as intrinsic frames of reference," which only confuses the issue further. People perceive objects in their environment relative to other objects in that same environment. In other words, landmarks and layout are complimentary systems for spatial recall. However, it is unknown how these two systems interact when both types of information are available. Thus, we have to make certain assumptions about the interaction between these two systems. For example, cognitive maps are not "absolute" but rather, as anyone can attest, are "used to provide a default...(which) modulated according to...task demands." Psychologists also think that cognitive maps are instance based, which accounts for "discriminative matching to past experience." These assumptions could soon be validated. Advances in virtual reality technology have pried open the door to this enigmatic field. Now experimenters find themselves creating scenarios that were impossible to imagine fifteen years ago. Virtual reality affords experimenters the luxury of extreme control over their test environment. Any variable can be manipulated, including things that would not be possible in reality. During one recent study researchers designed three different virtual towns, each of which had its own "unique road layout and a unique set of five stores." However, the overall footprint of the different maps was exactly the same size, "80 sq. units." In this experiment, participants had to partake in two different sets of trials. First, participants were assigned two of the three virtual landscapes and tasked with the role of a taxi driver. The participant's avatar picked up a total of 25 passengers and dropped them off at random locations throughout the map. Researchers measured the participants' "delivery path length" in both sets of the first trial. They found that there was a "clear decrease in path length with increased number of deliveries in a town." The participants' improved route length correlated with the increasing amount of experience they got driving in the virtual towns. However, as one would expect, the knowledge that participants gleaned from the first town did not transfer, or aid them, in their travels around the second town. Thus, Newman et al. (2006) inferred that the participants "formed a survey representation of each town." That is they drove around enough of the town to infer the general layout of the rest of it. The second set of trials involved the same task for the participants but with some changes to the context of the environment. Researchers added two more maps and made them smaller. It should be noted, though, that the second map set in this trial was standardized with the same layout and landmarks, meaning that all participants would experience this map on their second run. Moreover, three of the five maps "replaced some set of the landmarks with novel landmarks while the layout of target locations remain(ed) unchanged." The other two maps were either "identical" to the second traversed landscape of the second trial or both the landmarks and their relative locations were changed. Again, Newman et al. measured "excess path length," specifically focusing on the excess distance traveled on the first delivery of the second map in the second trial, where they believed that spatial learning would transfer mostly strongly from the first map. They found that the group that encountered altered building representations in the same locations had the highest level of layout knowledge transfer from the first town. The results of the first trial showed that people are capable of learning the spatial layout of an interactive environment. The second trial showed that despite a change in landmark presence, participants were still able to "find novel shortest routes." Because participants did not travel across previously memorized routes and still performed well according to the "excess path length" standard, Newman et al. concluded that these results evidenced "some higher-order survey representation of the environment." A study conducted at the University of Maryland compared the effect of different levels of immersion on spatial memory recall. In the study, 40 participants used both a traditional desktop and a head-mounted display to view two environments, a medieval town, and an ornate palace, where they memorized two sets of 21 faces presented as 3D portraits. After viewing these 21 faces for 5 minutes, followed by a brief rest period, the faces in the virtual environments were replaced with numbers and participants recalled which face was at each location. The study found on average, those who used the head-mounted display recalled the faces 8.8% more accurately, and with a greater confidence. The participants state that leveraging their innate vestibular and proprioceptive senses with the head-mounted display and mapping aspects of the environment relative to their body, elements that are absent with the desktop, was key to their success. Within the literature there is evidence that experts in a particular field are able to perform memory tasks in accordance with their skills at an exceptional level. The level of skill displayed by experts has also been said to exceed the limits of the normal capacity of both STM and WM. It is believed that because experts have an enormous amount of prelearned and task-specific knowledge, they are able to encode information in a more efficient way. 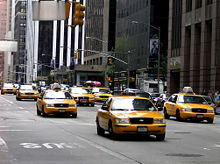 The famous yellow taxi cabs of New York city. The results of this study indicate that the taxi drivers' (experts') recall of streets was higher in both the route order condition and the map order condition than in the two random conditions. This indicates that the experts were able to use their prelearned spatial knowledge to organize the information in such a way that they surpassed STM and WM capacity limitations. The organization strategy that the drivers employed is known as chunking. Additionally, the comments made by the experts during the procedure point towards their use of route knowledge in completing the task. To ensure that it was in fact spatial information that they were encoding, the researchers also presented lists in alphabetical order and semantic categories. However, the researchers found that it was in fact spatial information that the experts were chunking, allowing them to surpass the limitations of both visuo-spatial STM and WM. Within the literature it has been found that certain species of paridae and corvidae (such as the black-capped chickadee and the scrub jay) are able to use spatial memory to remember where, when and what type of food they have cached. Recent studies with rats and squirrels, have also suggested that they are able to use spatial memory to locate previously hidden food. Experiments using the radial maze have allowed researchers to control for a number of variables, such as the type of food hidden, the locations where the food is hidden, the retention interval, as well as any odour cues that could skew results of memory research. In particular, studies have indicated that rats have memory for where they have hidden food and what type of food they have hidden. This is shown in retrieval behaviour, such that the rats are selective in going more often to the arms of the maze where they have previously hidden preferred food than to arms with less preferred food or where no food was hidden. Thus, the evidence for the spatial memory of some species of animals, such as rats, indicates that they do use spatial memory to locate and retrieve hidden food stores. During a study using GPS tracking to see where domestic cats go when their owners let them outside, has shown that cats have excellent spatial memory. Some of the cats in the study demonstrated exceptional long term spatial memory. One of such cats, that usually travelled no further than 200 m (660 ft) to 250 m (820 ft) from its home, had unexpectedly travelled some 1,250 m (4,100 ft) from its home. Researchers initially thought this to be a GPS malfunction, but soon discovered that the cat's owners went out of town that weekend, and that the house the cat went to was the owner's old house. The owners and the cat hadn't lived in that house for well over a year. Logie (1995) proposed that the visuo-spatial sketchpad is broken down into two subcomponents, one visual and one spatial. These are the visual cache and the inner scribe, respectively. The visual cache is a temporary visual store including such dimensions as colour and shape. Conversely, the inner scribe is a rehearsal mechanism for visual information and is responsible for information concerning movement sequences. Although a general lack of consensus regarding this distinction has been noted in the literature, there is a growing amount of evidence that the two components are separate and serve different functions. Visual memory is responsible for retaining visual shapes and colours (i.e., what), whereas spatial memory is responsible for information about locations and movement (i.e., where). This distinction is not always straightforward since part of visual memory involves spatial information and vice versa. For example, memory for object shapes usually involves maintaining information about the spatial arrangement of the features which define the object in question. In practice the two systems work together in some capacity but different tasks have been developed to highlight the unique abilities involved in either visual or spatial memory. For example, the visual patterns test (VPT) measures visual span whereas the Corsi Blocks Task measures spatial span. Correlational studies of the two measures suggest a separation between visual and spatial abilities, due to a lack of correlation found between them in both healthy and brain damaged patients. Support for the division of visual and spatial memory components is found through experiments using the dual-task paradigm. A number of studies have shown that the retention of visual shapes or colours (i.e., visual information) is disrupted by the presentation of irrelevant pictures or dynamic visual noise. Conversely, the retention of location (i.e., spatial information) is disrupted only by spatial tracking tasks, spatial tapping tasks, and eye movements. For example, participants completed both the VPT and the Corsi Blocks Task in a selective interference experiment. During the retention interval of the VPT, the subject viewed irrelevant pictures (e.g., avant-garde paintings). The spatial interference task required participants to follow, by touching the stimuli, an arrangement of small wooden pegs which were concealed behind a screen. Both the visual and spatial spans were shortened by their respective interference tasks, confirming that the Corsi Blocks Task relates primarily to spatial working memory. There are a variety of tasks that psychologists use to measure spatial memory on adults, children and animal models. These tasks allow professionals to identify cognitive irregularities in adults and children and allows researchers to administer varying types of drugs and or lesions in participants and measure the consequential effects on spatial memory. Also known as the Corsi Span Test, this psychological test is commonly used to determine the visual-spatial memory span and the implicit visual-spatial learning abilities of an individual. Participants sit with nine wooden 3x3-cm blocks fastened before them on a 25- x 30-cm baseboard in a standard random order. The experiment taps onto the blocks a sequence pattern which participants must then replicate. The blocks are numbered on the experimenters' side to allow for efficient pattern demonstration. The sequence length increases each trial until the participant is no longer able to replicate the pattern correctly. The test can be used to measure both short-term and long-term spatial memory, depending on the length of time between test and recall. The test was created by Canadian neuropsychologist Phillip Corsi, who modeled it after Hebb's digit span task by replacing the numerical test items with spatial ones. On average, most participants achieve a span of five items on the Corsi span test and seven on the digit span task. This is similar to the Corsi block tapping test but regarded as a more pure test of visual short-term recall. Participants are presented with a series of matrix patterns that have half their cells coloured and the other half blank. The matrix patterns are arranged in a way that is difficult to code verbally, forcing the participant to rely on visual spatial memory. Beginning with a small 2 x 2 matrix, participants copy the matrix pattern from memory into an empty matrix. The matrix patterns are increased in size and complexity at a rate of two cells until the participant's ability to replicate them breaks down. On average, participants' performance tends to break down at sixteen cells. This task is designed to measure spatial memory abilities in children. The experimenter asks the participant to visualize a blank matrix with a little man. Through a series of directional instructions such as forwards, backwards, left or right, the experimenter guides the participant's little man on a pathway throughout the matrix. At the end, the participant is asked to indicate on a real matrix where the little man that he or she visualized finished. The length of the pathway varies depending on the level of difficulty (1-10) and the matrices themselves may vary in length from 2 x 2 cells to 6 x 6. These are intended for measuring spatial ability in children. With this test, an experimenter presents the participant with a drawing of a maze with a picture of a man in the centre. While the participant watches, the experimenter uses his or her finger to trace a pathway from the opening of the maze to the drawing of the man. The participant is then expected to replicate the demonstrated pathway through the maze to the drawing of the man. Mazes vary in complexity as difficulty increases. First pioneered by Olton and Samuelson in 1976, the radial arm maze is designed to test the spatial memory capabilities of rats. Mazes are typically designed with a centre platform and a varying number of arms branching off with food placed at the ends. The arms are usually shielded from each other in some way but not to the extent that external cues cannot be used as reference points. In most cases, the rat is placed in the center of the maze and needs to explore each arm individually to retrieve food while simultaneously remembering which arms it has already pursued. The maze is set up so the rat is forced to return to the center of the maze before pursuing another arm. Measures are usually taken to prevent the rat from using its olfactory senses to navigate such as placing extra food throughout the bottom of the maze. The Morris water navigation task is a classic test for studying spatial learning and memory in rats and was first developed in 1981 by Richard G. Morris for whom the test is named. The subject is placed in a round tank of translucent water with walls that are too high for it to climb out and water that is too deep for it to stand in. Additionally, the walls of the tank are decorated with visual cues to serve as reference points. The rat must swim around the pool until by chance it discovers just below the surface the hidden platform onto which it can climb. Typically, rats swim around the edge of the pool first before venturing out into the center in a meandering pattern before stumbling upon the hidden platform. However, as time spent in the pool increases experience, the amount of time needed to locate the platform decreases, with veteran rats swimming directly to the platform almost immediately after being placed in the water. The hippocampus provides animals with a spatial map of their environment. It stores information regarding non-egocentric space (egocentric means in reference to one's body position in space) and therefore supports viewpoint independence in spatial memory. This means that it allows for viewpoint manipulation from memory. It is however, important for long-term spatial memory of allocentric space (reference to external cues in space). Maintenance and retrieval of memories are thus relational or context dependent. The hippocampus makes use of reference and working memory and has the important role of processing information about spatial locations. Blocking plasticity in this region results in problems in goal-directed navigation and impairs the ability to remember precise locations. Amnesic patients with damage to the hippocampus cannot learn or remember spatial layouts and patients having undergone hippocampal removal are severely impaired in spatial navigation. Monkeys with lesions to this area cannot learn object-place associations and rats also display spatial deficits by not reacting to spatial change. In addition, rats with hippocampal lesions were shown to have temporally ungraded (time-independent) retrograde amnesia that is resistant to recognition of a learned platform task only when the entire hippocampus is lesioned, but not when it is partially lesioned. Deficits in spatial memory are also found in spatial discrimination tasks. Large differences in spatial impairment are found among the dorsal and ventral hippocampus. Lesions to the ventral hippocampus have no effect on spatial memory, while the dorsal hippocampus is required for retrieval, processing short-term memory and transferring memory from the short term to longer delay periods. Infusion of amphetamine into the dorsal hippocampus has also been shown to enhance memory for spatial locations learned previously. These findings indicate that there is a functional dissociation between the dorsal and ventral hippocampus. Hemispheric differences within the hippocampus are also observed. A study on London taxi drivers, asked drivers to recall complex routes around the city as well as famous landmarks for which the drivers had no knowledge of their spatial location. This resulted in an activation of the right hippocampus solely during recall of the complex routes which indicates that the right hippocampus is used for navigation in large scale spatial environments. The hippocampus is known to contain two separate memory circuits. One circuit is used for recollection-based place recognition memory and includes the entorhinal-CA1 system, while the other system, consisting of the hippocampus trisynaptic loop (entohinal-dentate-CA3-CA1) is used for place recall memory and facilitation of plasticity at the entorhinal-dentate synapse in mice is sufficient to enhance place recall. Place cells are also found in the hippocampus. The parietal cortex encodes spatial information using an egocentric frame of reference. It is therefore involved in the transformation of sensory information coordinates into action or effector coordinates by updating the spatial representation of the body within the environment. As a result, lesions to the parietal cortex produce deficits in the acquisition and retention of egocentric tasks, whereas minor impairment is seen among allocentric tasks. Rats with lesions to the anterior region of the posterior parietal cortex reexplore displaced objects, while rats with lesions to the posterior region of the posterior parietal cortex displayed no reaction to spatial change. Parietal cortex lesions are also known to produce temporally ungraded retrograde amnesia. The dorsalcaudal medial entorhinal cortex (dMEC) contains a topographically organized map of the spatial environment made up of grid cells. This brain region thus transforms sensory input from the environment and stores it as a durable allocentric representation in the brain to be used for path integration. The entorhinal cortex contributes to the processing and integration of geometric properties and information in the environment. Lesions to this region impair the use of distal but not proximal landmarks during navigation and produces a delay-dependent deficit in spatial memory that is proportional to the length of the delay. Lesions to this region are also known to create retention deficits for tasks learned up to 4 weeks but not 6 weeks prior to the lesions. Memory consolidation in the entorhinal cortex is achieved through extracellular signal-regulated kinase activity. The medial prefrontal cortex processes egocentric spatial information. It participates in the processing of short-term spatial memory used to guide planned search behavior and is believed to join spatial information with its motivational significance. The identification of neurons that anticipate expected rewards in a spatial task support this hypothesis. The medial prefrontal cortex is also implicated in the temporal organization of information. Hemisphere specialization is found in this brain region. The left prefrontal cortex preferentially processes categorical spatial memory including source memory (reference to spatial relationships between a place or event), while the right prefrontal cortex preferentially processes coordinate spatial memory including item memory (reference to spatial relationships between features of an item). Leisons to the medial prefrontal cortex impair the performance of rats on a previously trained radial arm maze, however, rats can gradually improve to the level of the controls as a function of experience. Lesions to this area also cause deficits on delayed nonmatching-to-positions tasks and impairments in the acquisition of spatial memory tasks during training trials. The retrosplenial cortex is involved in the processing of allocentric memory and geometric properties in the environment. Inactivation of this region accounts for impaired navigation in the dark and thus it is implicated to be involved in the process of path integration. Lesions to the retrosplenial cortex consistently impair tests of allocentric memory, while sparing egocentric memory. Animals with lesions to the caudal retrosplenial cortex show impaired performance on a radial arm maze only when the maze is rotated to remove their reliance on intramaze cues. In humans, damage to the retrosplenial cortex results in topographical disorientation. Most cases involve damage to the right retrosplenial cortex and include Brodmann area 30. Patients are often impaired at learning new routes and at navigating through familiar environments. However, most patients usually recover within 8 weeks. The retrosplenial cortex preferentially processes spatial information in the right hemisphere. The perirhinal cortex is associated with both spatial reference and spatial working memory. It processes relational information of environmental cues and locations. Lesions in the perirhinal cortex account for deficits in reference memory and working memory, and increase the rate of forgetting of information during training trials of the Morris water maze. This accounts for the impairment in the initial acquisition of the task. Lesions also cause impairment on an object location task and reduce habituation to a novel environment. Spatial memories are formed after an animal gathers and processes sensory information about its surroundings (especially vision and proprioception). In general, mammals require a functioning hippocampus (particularly area CA1) in order to form and process memories about space. There is some evidence that human spatial memory is strongly tied to the right hemisphere of the brain. Spatial learning requires both NMDA and AMPA receptors, consolidation requires NMDA receptors, and the retrieval of spatial memories requires AMPA receptors. In rodents, spatial memory has been shown to covary with the size of a part of the hippocampal mossy fiber projection. The function of NMDA receptors varies according to the subregion of the hippocampus. NMDA receptors are required in the CA3 of the hippocampus when spatial information needs to be reorganized, while NMDA receptors in the CA1 are required in the acquisition and retrieval of memory after a delay, as well as in the formation of CA1 place fields. Blockade of the NMDA receptors prevents induction of long-term potentiation and impairs spatial learning. The CA3 of the hippocampus plays an especially important role in the encoding and retrieval of spatial memories. The CA3 is innervated by two afferent paths known as the perforant path (PPCA3) and the dentate gyrus (DG)-mediated mossy fibers (MFs). The first path is regarded as the retrieval index path while the second is concerned with encoding. Topographical disorientation is a cognitive disorder that results in the individual being unable to orient his or herself in the real or virtual environment. Patients also struggle with spatial information dependant tasks. These problems could possibly be the result of a disruption in the ability to access one's cognitive map, a mental representation of the surrounding environment or the inability to judge objects' location in relation to one's self. Developmental Topographical Disorientation (DTD) is diagnosed when patients have shown an inability to navigate even familiar surroundings since birth and show no apparent neurological causes for this deficiency such as lesioning or brain damage. DTD is a relatively new disorder and can occur in varying degrees of severity. Subjective cognitive complaint by the patient or his/her caregiver. Normal general cognitive function above the 16th percentile on the Korean version of the Mini-Mental State Examination (K-MMSE). Normal activities of daily living (ADL) assessed both clinically and on a standardized scale (as described below). Objective cognitive decline below the 16th percentile on neuropsychological tests. (TD) was assessed clinically in all participants. Neurological and neuropsychological evaluations were determined by a magnetic imaging scan which was performed on each participant. Voxel-based morphometry was used to compare patterns of gray-matter atrophy between patients with and without TD, and a group of normal controls. The outcome of the experiment was that they found TD in 17 out of the 41 MCI patients (41.4%). The functional abilities were significantly impaired in MCI patients with TD compared to in MCI patients without TD and that the presence of TD in MCI patients is associated with loss of gray matter in the medial temporal regions, including the hippocampus. Research with rats indicates that spatial memory may be adversely affected by neonatal damage to the hippocampus in a way that closely resembles schizophrenia. Schizophrenia is thought to stem from neurodevelopmental problems shortly after birth. Rats are commonly used as models of schizophrenia patients. Experimenters create lesions in the ventral hippocampal area shortly after birth, a procedure known as neonatal ventral hippocampal lesioning(NVHL). Adult rats who with NVHL show typical indicators of schizophrenia such as hypersensitivity to psychostimulants, reduced social interactions and impaired prepulse inhibition, working memory and set-shifting. Similar to schizophrenia, impaired rats fail to use environmental context in spatial learning tasks such as showing difficulty completing the radial arm maze and the Moris water maze. Recent research on spatial memory and wayfinding in an article by Ishikawa et al. in 2008 revealed that using a GPS moving map device reduces an individual's navigation abilities when compared to other participants who were using maps or had previous experience on the route with a guide. GPS moving map devices are frequently set up to allow the user to only see a small detailed close-up of a particular segment of the map which is constantly updated. In comparison, maps usually allow the user to see the same view of the entire route from departure to arrival. 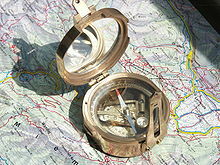 Other research has shown that individuals who use GPS travel more slowly overall compared to map users who are faster. GPS users stop more frequently and for a longer period of time whereas map users and individuals using past experience as a guide travel on more direct routes to reach their goal. Endonuclease VIII-like 1 (NEIL1) is a DNA repair enzyme that is widely expressed throughout the brain. NEIL1 is a DNA glycosylase that initiates the first step in base excision repair by cleaving bases damaged by reactive oxygen species and then introducing a DNA strand break via an associated lyase reaction. This enzyme recognizes and removes oxidized DNA bases including formamidopyrimidine, thymine glycol, 5-hydroxyuracil and 5-hydroxycytosine. NEIL1 promotes short-term spatial memory retention. Mice lacking NEIL1 have impaired short-term spatial memory retention in a water maze test. Nonverbal learning disability is characterized by normal verbal abilities but impaired visuospatial abilities. Problem areas for children with nonverbal learning disability are arithmetic, geometry, and science. Impairments in spatial memory is implicated in nonverbal learning disorder and other learning difficulties. Arithmetic word problems involve written text containing a set of data followed by one or more questions and require the use of the four basic arithmetic operations (addition, subtraction, multiplication, or division). Researchers suggest that successful completion of arithmetic word problems involves spatial working memory (involved in building schematic representations) which facilitates the creation of spatial relationships between objects. Creating spatial relationships between objects is an important part of solving word problems because mental operations and transformations are required. For example, consider the following question: "A child builds three towers using red and white coloured blocks of the same size. The lowest tower has 14 blocks; the highest has 7 more blocks. The intermediate tower has three blocks less than the highest one. How many blocks are in each of the three towers?" To solve the question, it is necessary to maintain incoming information (i.e., the text) and integrate it with previous information (such as knowledge for arithmetic operations). The individual must also select relevant (i.e., the spatial relationship between the blocks) and inhibit irrelevant information (i.e., the colours and textures of the blocks) and simultaneously build a mental representation of the problem. Researchers investigated the role of spatial memory and visual memory in the ability to complete arithmetic word problems. Children in the study completed the Corsi Block Task (forward and backward series) and a spatial matrix task, as well as a visual memory task called the house recognition test. Poor problem-solvers were impaired on the Corsi Block Tasks and the spatial matrix task, but performed normally on the house recognition test when compared to normally achieving children. The experiment demonstrated that poor problem solving is related specifically to deficient processing of spatial information. Sleep has been found to benefit spatial memory, by enhancing hippocampal-dependent memory consolidation. Hippocampal areas activated in route-learning are reactivated during subsequent sleep (NREM sleep in particular). It was demonstrated in a particular study that the actual extent of reactivation during sleep correlated with the improvement in route retrieval and thus memory performance the following day. Thus, the study established the idea that sleep enhances the systems-level process of consolidation that consequently enhances/improves behavioural performance. Furthermore, a period of wakefulness has no effect on stabilizing memory traces, in comparison to a period of sleep. Sleep after the first post-training night, i.e. on the second night, does not benefit spatial memory consolidation further. Therefore, sleeping in the first post-training night e.g. after learning a route, is most important. Sleep deprivation and sleep has also been a researched association. Sleep deprivation actually hinders memory performance improvement due to an active disruption of spatial memory consolidation. Therefore, spatial memory is enhanced by a period of sleep. ^ a b c d e Johnson, E.; Adamo-Villani, N. (2010). "A Study of the Effects of Immersion on Short-term Spatial Memory". Engineering and Technology. 71: 582–587. ^ a b c d e f g h i j k l Ang, S. Y.; Lee, K. (2008). "Central executive involvement in children's spatial memory". Memory. 16 (8): 918–933. doi:10.1080/09658210802365347. PMID 18802804. ^ a b c d e f Jones, D.; Farrand, P.; Stuart, G.; Morris, N.; et al. (1995). "Functional equivalence of verbal and spatial information in serial short-term memory". Journal of Experimental Psychology: Learning, Memory, and Cognition. 21 (4): 1008–1018. doi:10.1037/0278-7393.21.4.1008. ^ a b c d e Della Sala, S.; Gray, C.; Baddeley, A.; Allamano, N.; Wilson, L.; et al. (1999). "Pattern span: a tool for unwelding visuo-spatial memory". Neuropsychologia. 37 (10): 1189–1199. doi:10.1016/S0028-3932(98)00159-6. PMID 10509840. ^ a b c d e Mammarella, I. C.; Pazzaglia, F.; Cornoldi, C.; et al. (2008). "Evidence for different components in children's visuospatial working memory". British Journal of Developmental Psychology. 26 (3): 337–355. doi:10.1348/026151007X236061. ^ a b c d e f g h i j k l m n o p Kalakoski, V.; Saariluoma, P. (2001). "Taxi drivers' exceptional memory of street names". Memory and Cognition. 29 (4): 634–638. doi:10.3758/BF03200464. ^ Fisk, J. E.; Sharp, C. A.; et al. (2003). "The role of the executive system in visuo-spatial memory functioning". Brain and Cognition. 52 (3): 364–381. doi:10.1016/S0278-2626(03)00183-0. PMID 12907181. ^ a b c d e Chun, M.; Jiang, Y. (1998). "Contextual Cueing: implicit learning and memory of visual context guides spatial attention". Cognitive Psychology. 36 (1): 28–71. CiteSeerX 10.1.1.25.5066. doi:10.1006/cogp.1998.0681. PMID 9679076. ^ a b McNamara, T.; Hardy, J.; Hirtle, S.; et al. (1989). "Subjective hierarchies in spatial memory". Journal of Experimental Psychology. 15 (2): 211–227. doi:10.1037/0278-7393.15.2.211. PMID 2522511. ^ a b c Newman, E.L.; Caplan, J.B.; Kirschen, M.P. ; Korolev, I.O. ; Sekuler, R.; Kahana, M.J.; et al. (2007). "Learning Your Way Around Town: How Virtual Taxicab Drivers Learn to Use Both Layout and Landmark Information" (PDF). Cognition. 104 (2): 231–253. CiteSeerX 10.1.1.69.5387. doi:10.1016/j.cognition.2006.05.013. PMID 16879816. ^ Gillner S, Mallot H (2000). "The role of global and local landmarks in virtual environment navigation". Perception. 9 (1): 69–83. CiteSeerX 10.1.1.138.8266. doi:10.1162/105474600566628. ^ Krokos, Eric; Plaisant, Catherine; Varshney, Amitabh (16 May 2018). "Virtual Memory Palaces: Immersion Aids Recall". Virtual Reality: 1–15. doi:10.1007/s10055-018-0346-3. ^ a b c d e f Bird, L. R.; Roberts, W. A.; Abroms, B.; Kit, K. A.; Crupi, C. (2003). "Spatial memory for food hidden by rats (Rattus norvegicus) on the radial maze: studies of memory for where, what, and when". Journal of Comparative Psychology. 117 (2): 176–187. doi:10.1037/0735-7036.117.2.176. PMID 12856788. ^ Jennifer S. Holland (August 8, 2014). "Watch: How Far Do Your Cats Roam?". National Geographic. Retrieved August 23, 2016. ^ a b c Klauer, K.C. ; Zhao, Z.; et al. (2004). "Double dissociations in visual and spatial short-term memory". Journal of Experimental Psychology: General. 133 (3): 355–381. doi:10.1037/0096-3445.133.3.355. PMID 15355144. ^ a b c d e f g Passolunghi, M.C. ; Mammarella, I.C. ; et al. (2010). "Spatial and visual working memory ability in children with difficulties in arithmetic word problem solving". European Journal of Cognitive Psychology. 22 (6): 944–963. doi:10.1080/09541440903091127. ^ a b c Mammarella, I.C. ; Pazzaglia, F.; Cornoldi, C. (2008). "Evidence of different components in children's visuospatial working memory". British Journal of Developmental Psychology. 26 (3): 337–355. doi:10.1348/026151007X236061. ^ Corsi, P. M. (1972). "Human memory and the medial temporal region of the brain". Dissertation Abstracts International. 34 (2): 891. ^ Della Sala, S., Gray, C., Baddeley, A., & Wilson, L. (1997). The Visual Patterns Test: A new test of short-term visual recall. Feltham, Sufolk: Thames Valley Test Company. ^ Olton, D.S. ; Samuelson, R.J. (1976). "Remembrance of places past: spatial memory in rats". Animal Behaviour Processes. 2 (2): 97–116. CiteSeerX 10.1.1.456.3110. doi:10.1037/0097-7403.2.2.97. ^ Cole, M.R. ; Chappell-Stephenson, Robyn (2003). "Exploring the limits of spatial memory using very large mazes". Learning & Behavior. 31 (4): 349–368. doi:10.3758/BF03195996. ^ Morris, R. G. (1981). "Spatial Localization Does Not Require the Presence of Local Cues". Learning and Motivation. 12 (2): 239–260. doi:10.1016/0023-9690(81)90020-5. ^ O'Keefe, J.; Dostrovsky, J. (1971). "The hippocampus as a spatial map. Preliminary evidence from unit activity in the freely-moving rat". Brain Research. 34 (1): 171–175. doi:10.1016/0006-8993(71)90358-1. PMID 5124915. ^ a b c Squire, L. R. (1992). "Memory and the hippocampus: A synthesis from findings with rats, monkeys, and humans". Psychological Review. 99 (2): 195–231. doi:10.1037/0033-295X.99.2.195. PMID 1594723. ^ Ramos, J. M. J. (2000). "Long-term spatial memory in rats with hippocampal lesions". European Journal of Neuroscience. 12 (9): 3375–3384. doi:10.1046/j.1460-9568.2000.00206.x. PMID 10998120. ^ Winocur, G.; Moscovitch, M.; Caruana, D. A.; Binns, M. A. (2005). "Retrograde amnesia in rats with lesions to the hippocampus on a test of spatial memory". Neuropsychologia. 43 (11): 1580–1590. doi:10.1016/j.neuropsychologia.2005.01.013. PMID 16009240. ^ a b c Liu, P.; Bilkey, D. K. (2001). "The effect of excitotoxic lesions centered on the hippocampus or perirhinal cortex in object recognition and spatial memory tasks". Behavioral Neuroscience. 115 (1): 94–111. doi:10.1037/0735-7044.115.1.94. PMID 11256456. ^ Hebert, A. E.; Dash, P. K. (2004). "Nonredundant roles for hippocampal and entorhinal cortical plasticity in spatial memory storage". Pharmacology Biochemistry and Behavior. 79 (1): 143–153. doi:10.1016/j.pbb.2004.06.016. PMID 15388294. ^ a b Morris RG, Garrud P, Rawlins JN, O'Keefe J (1982). "Place navigation impaired in rats with hippocampal lesions" (PDF). Nature. 297 (5868): 681–683. Bibcode:1982Natur.297..681M. doi:10.1038/297681a0. PMID 7088155. ^ a b Save, E.; Poucet, B.; Foreman, N.; Buhot, M. (1992). "Object exploration and reactions to spatial and nonspatial changes in hooded rats following damage to parietal cortex or hippocampal formation". Behavioral Neuroscience. 106 (3): 447–456. doi:10.1037/0735-7044.106.3.447. PMID 1616611. ^ Martin, S. J.; de Hozl, L.; Morris, R. G. M. (2005). "Retrograde amnesia: neither partial nor complete hippocampal lesions in rats result in preferential sparing of remote spatial memory, even after reminding". Neuropsychologia. 43 (4): 609–624. doi:10.1016/j.neuropsychologia.2004.07.007. PMID 15716151. ^ Bannerman, D. M.; Deacon, R. M. J.; Offen, S.; Friswell, J.; Grubb, M.; Rawlins, J. N. P. (2002). "Double dissociation of function within the hippocampus: Spatial memory and hyponeophagia". Behavioral Neuroscience. 116 (5): 884–901. doi:10.1037/0735-7044.116.5.884. PMID 12369808. ^ Moser, M.; Moser, E. I. (1998). "Distributed encoding and retrieval of spatial memory in the hippocampus". The Journal of Neuroscience. 18 (18): 7535–7542. PMID 9736671. ^ a b Lee, I.; Kesner, R. P. (2003). "Time-dependent relationship between the dorsal hippocampus and the prefrontal cortex in spatial memory". The Journal of Neuroscience. 23 (4): 1517–1523. PMID 12598640. ^ McGaugh, J. L. (2000). "Memory—a century of consolidation". Science. 287 (5451): 248–251. Bibcode:2000Sci...287..248M. doi:10.1126/science.287.5451.248. PMID 10634773. ^ Maguire, E. A.; Frackowiak, R. S. J.; Frith, C. D. (1997). "Recalling routes around London: Activation of the right hippocampus in taxi drivers". The Journal of Neuroscience. 17 (18): 7103–7110. PMID 9278544. ^ Brun, V. H.; Otnaess, M. K.; Molden, S.; Steffenach, H.; Witter, M. P.; Moser, M.; Moser, E. I. (2002). "Place cells and place recognition maintained by direct entorhinal-hippocampal circuitry". Science. 296 (5576): 2243–2246. Bibcode:2002Sci...296.2243B. doi:10.1126/science.1071089. PMID 12077421. ^ Goodrich-Hunsaker NJ, Hunsaker MR, Kesner RP (2008). "The interactions and dissociations of the dorsal hippocampus subregions: how the dentate gyrus, CA3, and CA1 process spatial information". Behav. Neurosci. 122 (1): 16–26. doi:10.1037/0735-7044.122.1.16. PMID 18298245. ^ Saab BJ, Georgiou J, Nath A, Lee FJ, Wang M, Michalon A, Liu F, Mansuy IM, Roder JC (2009). "NCS-1 in the dentate gyrus promotes exploration, synaptic plasticity, and rapid acquisition of spatial memory". Neuron. 63 (5): 643–56. doi:10.1016/j.neuron.2009.08.014. PMID 19755107. ^ Colby, C. L.; Goldberg, M. E. (1999). "Space and attention in parietal cortex". Annual Review of Neuroscience. 22: 319–349. doi:10.1146/annurev.neuro.22.1.319. PMID 10202542. ^ Save, E.; Moghaddam, M. (1996). "Effects of lesions of the associative parietal cortex on the acquisition and use of spatial memory in egocentric and allocentric navigation tasks in the rat". Behavioral Neuroscience. 110 (1): 74–85. doi:10.1037/0735-7044.110.1.74. PMID 8652075. ^ a b Cho, Y. H.; Kesner, R. P. (1996). "Involvement of entorhinal cortex or parietal cortex in long-term spatial discrimination memory in rats: Retrograde amnesia". Behavioral Neuroscience. 110 (3): 436–442. doi:10.1037/0735-7044.110.3.436. PMID 8888988. ^ Hafting, T.; Fyhn, M.; Molden, S.; Moser, M.; Moser, E. I. (2005). "Microstructure of a spatial map in the entorhinal cortex". Nature. 436 (7052): 801–806. Bibcode:2005Natur.436..801H. doi:10.1038/nature03721. PMID 15965463. ^ Fyhn, M.; Molden, S.; Witter, M. P.; Moser, E. I.; Moser, M. (2004). "Spatial representation in the entorhinal cortex". Science. 305 (5688): 1258–1264. Bibcode:2004Sci...305.1258F. doi:10.1126/science.1099901. PMID 15333832. ^ a b Parron, C.; Save, E. (2004). "Comparison of the effects of entorhinal and retrosplenial cortical lesions on habituation, reaction to spatial and non-spatial changes during object exploration in the rat". Neurobiology of Learning and Memory. 82 (1): 1–11. doi:10.1016/j.nlm.2004.03.004. PMID 15183166. ^ Parron, C.; Poucet, B.; Save, E. (2004). "Entorhinal cortex lesions impair the use of distal but not proximal landmarks during place navigation in the rat". Behavioural Brain Research. 154 (2): 345–352. doi:10.1016/j.bbr.2004.03.006. PMID 15313022. ^ Nagahara, H. A.; Otto, T.; Gallagher, M. (1995). "Entorhinal-perirhinal lesions impair performance of rats on two versions of place learning in the Morris water maze". Behavioral Neuroscience. 109 (1): 3–9. doi:10.1037/0735-7044.109.1.3. PMID 7734077. ^ Hebert, A. E.; Dash, P. K. (2002). "Extracellular signal-regulated kinase activity in the entorhinal cortex is necessary for long-term spatial memory". Learning & Memory. 9 (4): 156–166. doi:10.1101/lm.48502. PMC 182586. PMID 12177229. ^ Pratt, W. E.; Mizumori, S. J. Y. (2001). "Neurons in rat medial prefrontal cortex show anticipatory rate changes to predictable differential rewards in a spatial memory task". Behavioural Brain Research. 123 (2): 165–183. doi:10.1016/S0166-4328(01)00204-2. PMID 11399329. ^ Kesner, R. P.; Holbrook, T. (1987). "Dissociation of item and order spatial memory in rats following medial prefrontal cortex lesions". Neuropsychologia. 25 (4): 653–664. doi:10.1016/0028-3932(87)90056-X. PMID 3658148. ^ Slotnick, S. D.; Moo, L. R. (2006). "Prefrontal cortex hemispheric specialization for categorical and coordinate visual spatial memory". Neuropsychologia. 44 (9): 1560–1568. doi:10.1016/j.neuropsychologia.2006.01.018. PMID 16516248. ^ Becker, J. T.; Walker, J. A.; Olton, D. S. (1980). "Neuroanatomical bases of spatial memory". Brain Research. 200 (2): 307–320. doi:10.1016/0006-8993(80)90922-1. PMID 7417818. ^ Aggleton, J. P.; Neave, N.; Nagle, S.; Sahgal, A. (1995). "A comparison of the effects of medial prefrontal, cingulate cortex, and cingulum bundle lesions on tests of spatial memory: Evidence of a double dissociation between frontal and cingulum bundle contributions". The Journal of Neuroscience. 15 (11): 7270–7281. PMID 7472481. ^ Lacroix, L.; White, I.; Feldon, J. (2002). "Effect of excitotoxic lesions of rat medial prefrontal cortex on spatial memory". Behavioural Brain Research. 133 (1): 69–81. doi:10.1016/S0166-4328(01)00442-9. PMID 12048175. ^ Cooper, B. G.; Manka, T. F.; Mizumori, S. J. Y. (2001). "Finding your way in the dark: The retrosplenial cortex contributes to spatial memory and navigation without visual cues". Behavioral Neuroscience. 115 (5): 1012–1028. doi:10.1037/0735-7044.115.5.1012. PMID 11584914. ^ Vann, S. D.; Aggleton, J. P. (2002). "Extensive cytotoxic lesions of the rat retrosplenial cortex reveal consistent deficits on tasks that tax allocentric spatial memory". Behavioral Neuroscience. 116 (1): 85–94. doi:10.1037/0735-7044.116.1.85. PMID 11895186. ^ Vann, S. D.; Wilton, L. A.; Muir, J. L.; Aggleton, J. P. (2003). "Testing the importance of the caudal retrosplenial cortex for spatial memory in rats". Behavioural Brain Research. 140 (1–2): 107–118. doi:10.1016/S0166-4328(02)00274-7. PMID 12644284. ^ a b Maguire, E. A. (2001). "The retrosplenial contribution to human navigation: A review of lesion and neuroimaging findings". Scandinavian Journal of Psychology. 42 (3): 225–238. doi:10.1111/1467-9450.00233. PMID 11501737. ^ Liu, P.; Bilkey, D. K. (1998). "Perirhinal cortex contributions to performance in the Morris water maze". Behavioral Neuroscience. 112 (2): 304–315. doi:10.1037/0735-7044.112.2.304. PMID 9588480. ^ Gutbrod, K; Cohen, R; Maier, T; Meier, E (1987). "Memory for spatial and temporal order in aphasics and right hemisphere damaged patients". Cortex. 23 (3): 463–74. doi:10.1016/s0010-9452(87)80007-2. PMID 3677733. ^ Nunn, JA; Graydon, FJ; Polkey, CE; Morris, RG (1999). "Differential spatial memory impairment after right temporal lobectomy demonstrated using temporal titration". Brain. 122 (1): 47–59. doi:10.1093/brain/122.1.47. ^ Tucker, DM; Hartry-Speiser, A; McDougal, L; Luu, P; Degrandpre, D (1999). "Mood and spatial memory: emotion and right hemisphere contribution to spatial cognition". Biol Psychol. 50 (2): 103–25. doi:10.1016/S0301-0511(99)00005-8. PMID 10403200. ^ Liang, KC; Hon, W; Tyan, YM; Liao, WL (1994). "Involvement of hippocampal NMDA and AMPA receptors in acquisition, formation and retrieval of spatial memory in the Morris water maze". Chin J Physiol. 37 (4): 201–12. PMID 7796636. ^ Crusio, W. E.; Schwegler, H. (2005). "Learning spatial orientation tasks in the radial-maze and structural variation in the hippocampus in inbred mice". Behavioral and Brain Functions. 1 (1): 3. doi:10.1186/1744-9081-1-3. PMC 1143776. PMID 15916698. ^ Lee, I.; Kesner, R. P. (2002). "Differential contribution of NMDA receptors in hippocampal subregions to spatial working memory". Nature Neuroscience. 5 (2): 162–168. doi:10.1038/nn790. PMID 11780144. ^ Morris, R. G. M.; Anderson, E.; Lynch, G. S.; Baudry, M. (1986). "Selective impairment of learning and blockade of long-term potentiation by an N-methyl-D-aspartate receptor anatagonist, AP5". Nature. 319 (6056): 774–776. Bibcode:1986Natur.319..774M. doi:10.1038/319774a0. PMID 2869411. ^ Lee, I.; Kesner, R. P. (2004). "Encoding versus retrieval of spatial memory: Double dissociation between the dentate gyrus and the perforant path inputs into CA3 in the dorsal hippocampus". Hippocampus. 14 (1): 66–76. doi:10.1002/hipo.10167. PMID 15058484. ^ Stark, M; Coslett, HB; Saffran, EM (1996). Impairment of an egocentric map of locations: implications for perception and action. 13. Cogn Neuropsychol. pp. 481–523. ^ Tae-Sung Lim, Giuseppe Iaria, So Young Moon. "Topographical Disorientation in Mild Cognitive Impairment: A Voxel-Based Morphometry Study." 9 August 2010. 16 April 2011 <http://www.neurolab.ca/2010(5)_Lim.pdf>. ^ Lewis, D.A. ; Levitt, P. (2002). "Schizophrenia as a disorder of neurodevelopment". Annual Review of Neuroscience. 25: 409–432. doi:10.1146/annurev.neuro.25.112701.142754. PMID 12052915. ^ Lipska, B.K. ; Weinberger, D.R. (2000). "To model a psychiatric disorder in animals: Schizophrenia as a reality test". Neuropsychopharmacology. 23 (3): 223–239. doi:10.1016/S0893-133X(00)00137-8. PMID 10942847. ^ Lipska, B.K. ; Aultman, J.M. ; Verma, A.; Weinberger, D.R. ; Moghaddam, B. (2002). "Neonatal damage of the ventral hippocampus impairs working memory in the rat". Neuropsychopharmacology. 27 (1): 47–54. doi:10.1016/S0893-133X(02)00282-8. PMID 12062906. ^ Marquis, J. P.; Goulet, S.; Dore, F. Y. (2008). "Dissociable onset of cognitive and motivational dysfunctions following neonatal lesions of the ventral hippocampus in rats". Behavioral Neuroscience. 122 (3): 629–642. doi:10.1037/0735-7044.122.3.629. PMID 18513133. ^ Brady, A. M. (2009). "Neonatal ventral hippocampal lesions disrupt set-shifting ability in adult rats". Behavioural Brain Research. 205 (1): 294–298. doi:10.1016/j.bbr.2009.07.025. PMID 19646488. ^ Marquis, J.P.; Goulet, S.; Dore, F.Y. (2008). "Neonatal ventral hippocampus lesions disrupt extra-dimensional shift and alter dendritic spine density in the medial prefrontal cortex of juvenile rats". Neurobiology of Learning and Memory. 90 (2): 339–346. doi:10.1016/j.nlm.2008.04.005. PMID 18490183. ^ Levin, E.D. ; Christopher, N.C. (2006). "Effects of clozapine on memory function in the rat neonatal hippocampal lesion model of schizophrenia". Progress in Neuro-Psychopharmacology and Biological Psychiatry. 30 (2): 223–229. doi:10.1016/j.pnpbp.2005.10.018. PMID 16356617. ^ Silva-Gomez, A.B. ; Bermudez, M.; Quirion, R.; Srivastava, L.K. ; Picazo, O.; Flores, G. (2003). "Comparative behavioral changes between male and female postpubertal rats following neonatal excitotoxic lesions of the ventral hippocampus". Brain Research. 973 (2): 285–292. doi:10.1016/S0006-8993(03)02537-X. PMID 12738072. ^ Ishikawa, T.; Hiromichi, F.; Osama, I.; Atsuyuki, O. (2008). "Wayfinding with a GPS-based mobile navigation system: A comparison with maps and direct experience". Journal of Environmental Psychology. 28: 74–82. doi:10.1016/j.jenvp.2007.09.002. ^ a b Canugovi C, Yoon JS, Feldman NH, Croteau DL, Mattson MP, Bohr VA (September 2012). "Endonuclease VIII-like 1 (NEIL1) promotes short-term spatial memory retention and protects from ischemic stroke-induced brain dysfunction and death in mice". Proc. Natl. Acad. Sci. U.S.A. 109 (37): 14948–53. doi:10.1073/pnas.1204156109. PMC 3443144. PMID 22927410. ^ Mammarella, I.C. ; Lucangeli, D.; Cornoldi, C. (2010). "Spatial working memory and arithmetic deficites in children with nonverbal learning difficulties". Journal of Learning Disabilities. 43 (5): 455–468. doi:10.1177/0022219409355482. PMID 20375290. ^ a b c Ferrara M, Iaria, G, Tempesta D, Curcio G, Moroni F, Marzano C, De Gennaro L, Pacitti C (2008). "Sleep to find your way: the role of sleep in the consolidation of memory for navigation in humans". Hippocampus. 18 (8): 844–851. doi:10.1002/hipo.20444. PMID 18493970. ^ Peigneux, P.; Laureys, S.; Fuchs, S.; Collette, F.; Perrin, F.; Reggers, J.; et al. (2004). "Are Spatial memories strengthened in the human hippocampus during slow wave sleep?". Neuron. 44 (3): 535–545. doi:10.1016/j.neuron.2004.10.007. PMID 15504332.